As a German citizen who has lived in Scotland for 14 years, I’ve been part of social and civic movements in both countries. For example, last month I was at the Isle of Eigg’s joyous community land buy-out 20th anniversary celebrations. This month, I participated in the degrowth summer school in Germany, which ran in conjunction with the anti-coal Klimacamp (climate camp). Social movements in Scotland and Germany have different qualities and strengths. In Scotland, movements can be alive with a profound depth and connectedness to cultural roots, while striving to not fall into a trap of ethnic boundaries – as exemplified in the name of the Galgael community, combining gael with gall, which means ‘stranger, foreigner’. In Germany, broad movements such as the climate justice movement are thriving. The climate camp exemplifies a space for the confluence of diverse activist and academic groups also from neigbouring countries. Talks and workshops are frequently simultaneously translated into four languages. The vibrancy and buzz resulting from such diversity creates a living laboratory for methods of change-making, including civil disobedience against the nearby open-cast coal mine. What about social movements in Scotland in the light of Brexit? The farcical negotiation process aside, it can seem sometimes that people are sick of hearing about it- the most significant European event since the end of the cold war. There was a lack of public information about the projected consequences of leaving the European Union. Predictions include problems with supplies of materials necessary for cancer treatment, uncertainties in food prices and clashes between UK and US food culture if a US-UK trade deal takes effect (buzzword: chlorinated chicken). How can civic movements respond by remaining rooted in place, and at the same time expand, forge connections beyond borders and addressing the bigger picture? 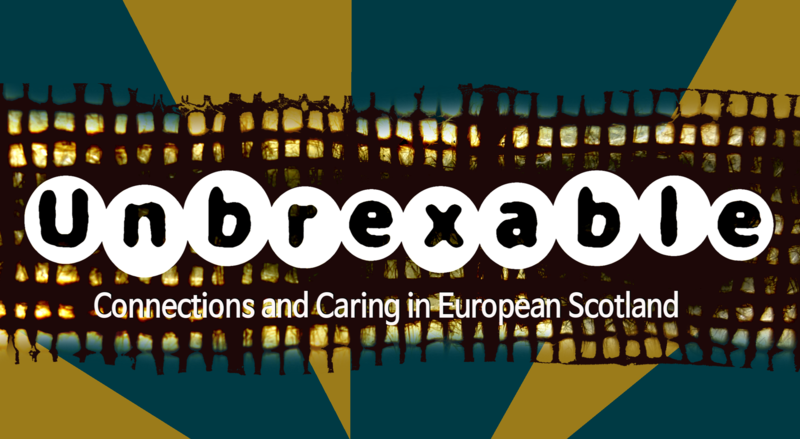 On the 2nd of September, a crowd will gather in the Pearce Institute to for the conference Unbrexable – Connections and Caring in European Scotland. ‘We’ are concerned citizens, activists, academics, community workers, artists and migrants who wish to consolidate collectively what kinds of initiatives and movements Scotland needs to become the kind of welcoming, inclusive and socially and environmentally just country we want to live in. The driver of many Leave votes, the end to freedom of movement between the UK and EU countries has been announced for March 2019, and the future rights of EU citizens currently living and working in the UK are uncertain. The economic consequences are much more wide-ranging than even Leave voters could previously imagine – but what about the cultural consequences? Cultural vibrancy is enabled through encounters that foster connections and mutual understanding, and fortifying Britain doesn’t only concern migration. Arab artists being denied visas to perform at the Edinburgh Fringe Festival are only one example of the Home Office’s institutionalised racism and inability to nurture a rich cultural tapestry. Closing borders and minds to migrants and visitors is an act of cultural self-harm. In these times, working on nurturing connections between social change-makers across borders becomes even more important to resist isolation and to nurture connections. The Centre for Human Ecology, in partnership with Govan Folk University, has conceived of Unbrexable as series of events and interventions revolving around the idea of citizen diplomacy, bypassing official channels in order to salvage, protect and strengthen the connections with European counterparts. The Unbrexable conference will bring together people who are part of movements and organisations that work for social change, and share values of inclusiveness and solidarity. Contributors are active in diverse fields such as migrant solidarity networks, grassroots European activist movements such as the degrowth movement which outlines alternative narratives to economic growth, European youth exchanges, tools for collaboration, academia and community arts. The day will combine talks with participatory workshops, and a panel discussion and plenary on how we can actively move forward through ’emotional citizenry’ at home and abroad – building bridges across newly enforced borders. We might live on an island, but the sea connects us all. We intend to spark movement-building connections which lead to further events and spaces that collectively explore different pathways to the status quo. We hope that you will join us in declaring collectively that WE ARE UNBREXABLE!